The sire of 639, YA Quantum 211 is a full brother to 020. A pathfinder dam, 639 posts 6 BWR @ 98, 6 NR @ 104 and 5 YR @ 105. 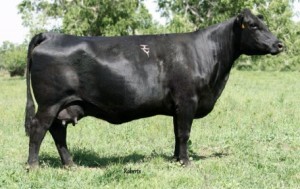 Her dam YA Pride 375 has 4 daughters in production that have weaned 13 calves with a nursing ratio of 103. Currently, she is nursing a bull calf by YA BLACK CEDAR 162 that we will likely retain for our own use. Her ET calves by Sinclair Emulation XXP are due in 2015.